Q: What’s the difference between a pineapple and a human child? A: Pineapples are more profitable. Let’s face it – kids have.. yuck … needs! Maslow even came up with a hierarchy of needs that must be met before you can get the little tykes to do anything. Physical well-being, safety, emotional… Argh! It’s just so much work! Pineapples, however, are money-makers from the get go. Chop them up, and you’ve got a tropical fruit salad. Juice them, and you can make about a hundred different premium cocktails. Heck! Just plop one in a hat and you’ve got an island-themed mascot! But kids!? You can’t even get them to take a lucrative standardized test without… bleugh … educating them first. Imagine if you could make pineapples take tests and get grades instead. Schooling would be like a gardening contest. Who has the best recipe for success? There would be no intangibles like the effects of poverty, home-life, special needs. It would all be neat, measurable and objective. Yes, sir. Pineapples would be great for business – especially if your business is education. 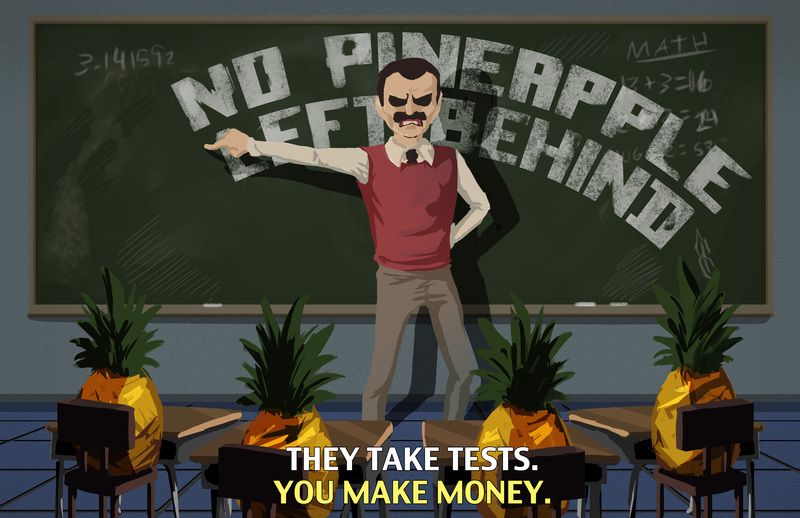 That’s the premise of Subaltern Games current project No Pineapple Left Behind. The satirical fantasy video game is the brainchild of former teacher, Seth Alter. Alter taught at a Boston middle school before giving up the classroom for the programmer’s chair. According to his blog, he “became fed up with the callous administration” and decided he could teach more effectively through video games. The project was completed through a $10K Kickstarter campaign in January 2013 and released in November of the same year. A Kickstarter campaign is anticipated to help the company finish this ambitious project. 1) WHO ARE PUBLIC SCHOOLS DESIGNED FOR – CHILDREN OR WIDGETS? 2) WHAT IS THE PURPOSE OF OUR SCHOOLS – EDUCATING KIDS OR MAKING MONEY? Examine the state and federal education policies of the last dozen years and you’ll be forgiven for thinking we’re servicing widgets. Federal programs like No Child Left Behind and Race to the Top increase high-stakes standardized testing to absurd lengths. Public schools are repeatedly defunded at the state and federal level, forcing them to rely on local taxes to survive. This is fine for affluent districts that can just raise property taxes, but it is unsustainable for the 99%. 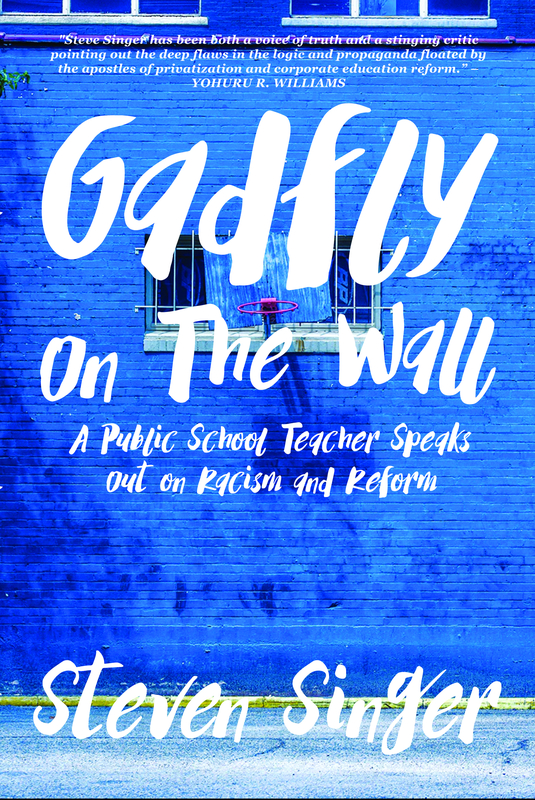 To make up the difference, poorer schools are forced to compete for the remaining funds by enacting reforms that don’t benefit children but enrich the special interests that lobbied for them. Test companies like Pearson rake in the cash creating and scoring the tests on the one hand, and then earn even more profit providing the inevitable remedial test prep materials districts are forced to buy on the other. Microsoft billionaire Bill Gates poses as a disinterested philanthropist funding Common Core, but then increases his company’s market share by providing the computers and technology necessary to take the standardized tests required by Common Core. Moreover, for-profit companies entice away students to charter schools in order to garnish their per student funding. Then just before it comes time to take their standardized tests and thus be judged as effective or not based on these scores, charters boot the lowest achievers back to the public schools. The money, however, they keep. And they get to boast of how well they teach kids since the only ones left are the cream of the crop! Children then become little more than a means to school funding. Schools are forced to use children to earn money for the district to remain open. But schools are supposed to be places where funding is used to educate kids – not places where kids are used to earn funding. 3) IS COMPETITION THE BEST MOTIVE FOR A PUBLIC SERVICE? No. Emphatically not. When you have competition, you by necessity have winners and losers. The goal of public schooling is to educate EVERYONE. Didn’t we call this nonsense No Child Left Behind? How can it be about doing that, if the goal is to see who wins the Race to the Top? In a race, the objective is to leave everyone else behind! 4) WHAT IS THE ROLE OF THE CLASSROOM TEACHER – GUIDE OR SORCERER? In the early draft of NPLB, teachers will cast spells on their pineapple classes to get them to learn. This works well, apparently, for fruit. However, if classes are left unattended, the pineapples will turn back into children who are much harder to educate in this manner. Go to any school of education in any university in the country and you’ll learn this simple fact: Education is not something someone does to you. No one can put a finger to your head and make you learn. There are no mystical words to engender wholesale epiphanies. Learning is a complex process that requires a relationship between the teacher and student. It happens gradually over time. There is no magic here. However, our national education policy acts as if all children go to Hogwarts. Teachers are evaluated on how much their students learn. That’s only looking at one part of this complex relationship. What about the children? Aren’t they part of this equation, too? Moreover, the metric administrators are being forced to use to determine if this learning has actually taken place is… standardized test scores! These are tests graded by temps who may or may not have an education degree working for corporations that make more money if more kids fail the tests! That’s a classic case of conflict of interests. So we have a faulty evaluation method that is using faulty data to come up with faulty conclusions that will determine whether a teacher gets to keep his job or not. The ONLY way that works is through magic! And so we’re left with the consolation of satire and video games. Will No Pineapple Left Behind be a big hit on the market? It’s still to early to tell. However, the concept shows tremendous promise. Perhaps players will recognize their own schools in the game. Perhaps policy-makers will become embarrassed and discredited as the objects of virtual ridicule. Perhaps encountering such everyday absurdism in video game form will serve as a wakeup call to the slumbering masses. Otherwise, it may be game over for American Education. UPDATE: No Pineapple Left Behind is now on Kickstarter looking to raise $35,000 to finish the project. New pictures, promos and information is available on the site. haha. You forgot that the pineapples that don’t make the cut just go into compost. I’m curious to see this game, but somehow I’m sure it will only fuel my anger and frustration. We won’t know until the game’s done, but I think it shows great promise. Sometimes all we have left is satire to keep us sane. Your comment tells me we’ve been I the same state of mind. If you don’t laugh, you cry. Best of luck!